Sitting at my rented desk [before I worked in the shed at the bottom of my garden] an email dropped into my inbox. This happens most days, but this one had in it words I'd wanted to hear for some years but had never thought would happen. 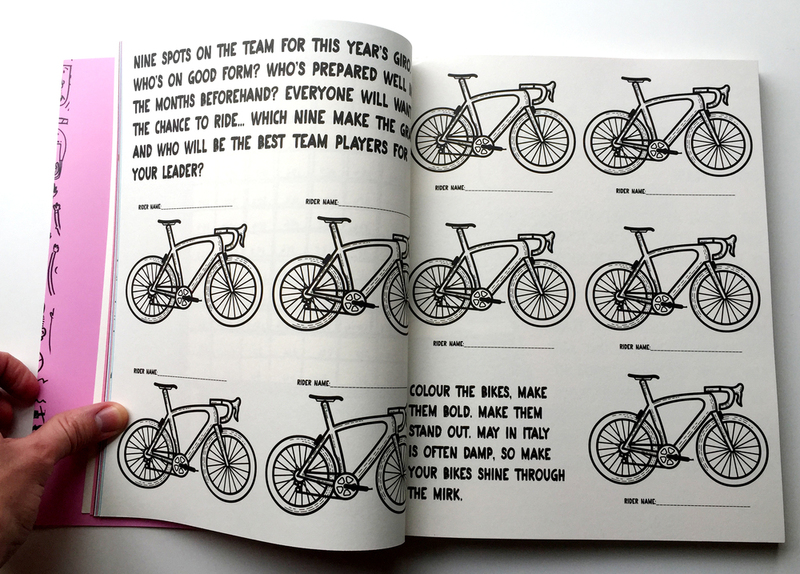 I write to see if you might be interested in the idea of creating a cycling-themed volume of drawings and line illustrations taking its inspiration from the large number of colouring books that have started to appear in bookshops. I clicked the kettle on, poured the now boiled water onto the tea bag, bounced it around a bit, popped it into the bin, unraveled a hob knob, added milk to my mug, stirred, slurped and continued reading. I've always thought a book would be a really fun idea, and after the success of the colouring in wallpaper I created with the lovely people at Drops in 2015 I thought this might just be the perfect way for me to end up in print. I excitedly replied to John at Velodrome Publishing. We soon met up over tea [of course] and cake and talked more about the book and the ideas we both had for it. I mentioned quickly that I've never really been into 'mindfulness' or colouring to calm you down or meditate. Perhaps it's cause it's my job, and I love it to much. I'm not saying it's bad in anyway, I just find that notion a bit kind of airy fairy, dog on a string hippy type for me and that's never been my bag. Colouring is fun and daft moments of creativity aren't something to be scared of, or left in childhood with crayola wax crayons. Bright colours are everywhere and having a little moment to grab a pen and throw an idea onto a page should be instant and make you smile whatever age you are. We consider things to much these days, especially in this era of social media where the moment you say the wrong thing there's a pile on and you get a bollocking. 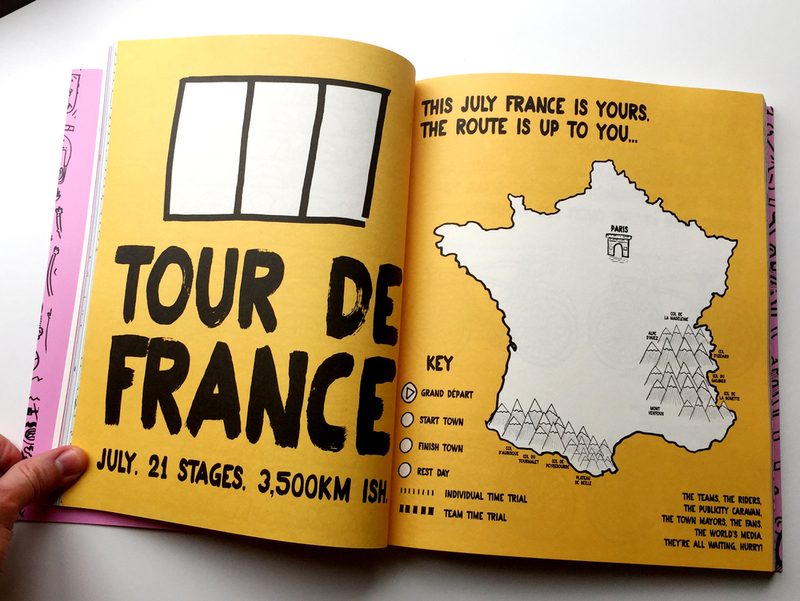 I wanted a book for any cycling fan to pick up, read, smile and have a moment of fun anytime, any place. I didn't want it to be just colouring either, the plan was to try and take it a bit further and add in elements of design, dot to dot, creative writing, and silliness. The total of 144 pages felt like a large mountain to climb, but after meeting up for a few days with John and coming up with a whole wall load of ideas I soon realised it was and could happen within the time frame we'd set out. I worked in thick black sharpie on cheap A4 printer paper. 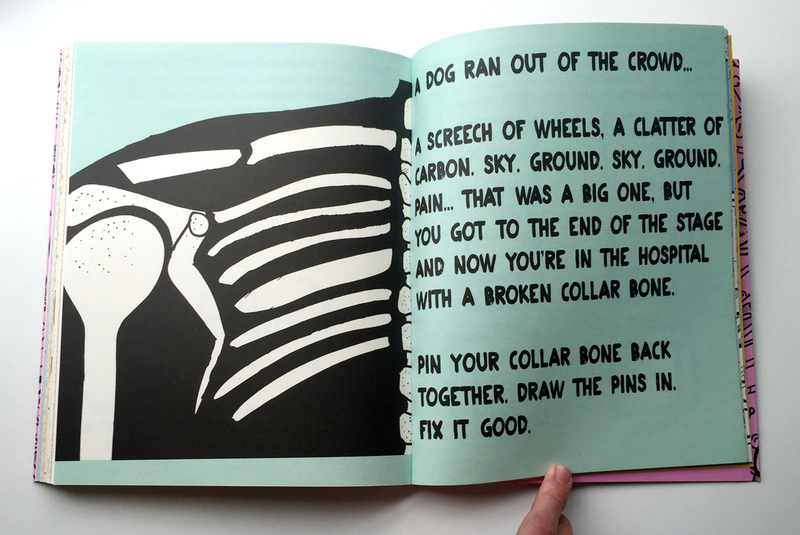 I wanted the book to feel as instant as the work I wanted people to create inside it. As if I'd popped over, drawn in a sketch book quickly, and then buggered off leaving it behind. My thought was that if the drawings inside felt too perfect, too crisp and immaculate then people would have even more concern about getting their own pens out and drawing or colouring in it themselves. This was my main aim, to create something that people really want to create stuff in. If it's left on a shelf and looked at as a nice thing, then that's great, but it's failed. The moment it gets filled with doodles, scribbles, daubs, pencil marks and cut out bits of sticky back plastic I've won. I wasn't sure about adding in the portraits of legendary riders I've kind of become a bit known for at first. For me it was going to be about new stuff. But after a few more chats with John, and a good hard talking to from myself about how people would probably want them in there, I changed my mind. And I'm pleased I did. They add to the structure and history of the whole thing they give the book character and a feeling that it knows about the history of the sport. 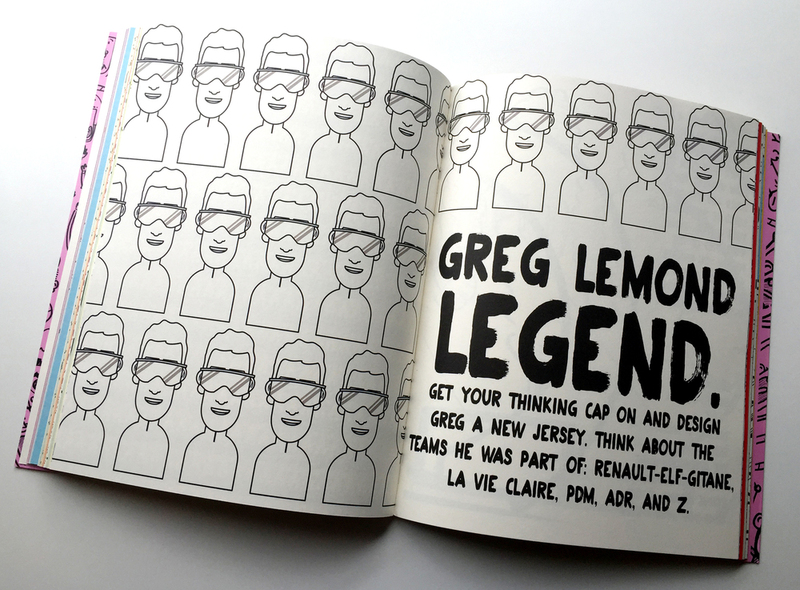 It's also a really fun way of introducing people to those riders if they'd never heard of them as they have the chance to research their old jerseys, stories and escapades before creating things for them on the pages. As the months ticked by [I think it took me about 4 in total to create the whole book] the pile of paper, ideas, reference material and scribbles got larger and larger. But eventually everything had been scanned [RIP my first scanner] and was ready in my machine to put into some sort of order, and add a bit of colour. Adding colour to the pages really helps the book pop. As you turn the pages your eyes are met with some really zingy tones and it all helps keep the fun going throughout. 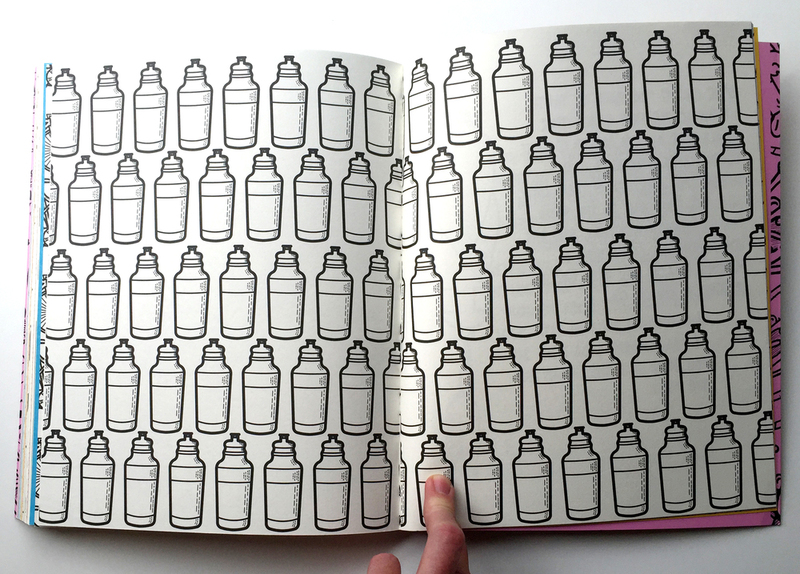 It also fills in some blank sections which could seem a little daunting if you were left with just white. 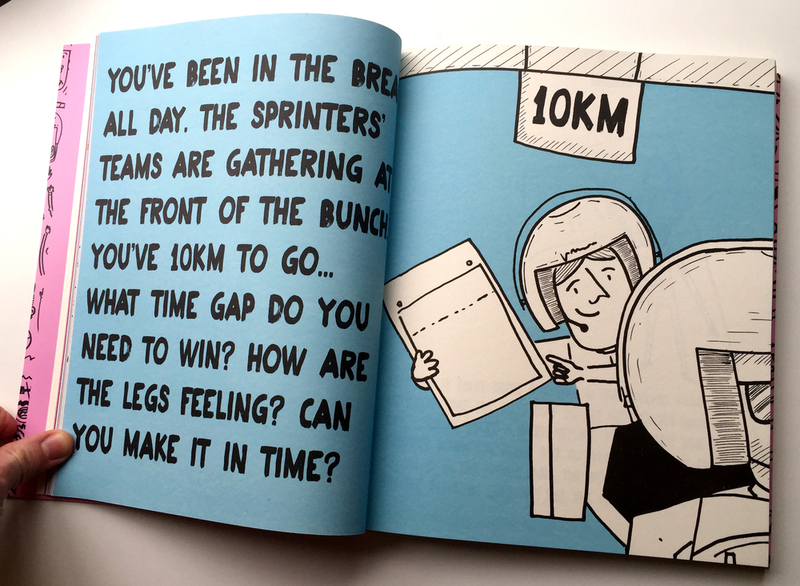 I laid out the book and sent it over to Velodrome for editing and feedback. It was pretty satisfying to have it all ready. I clicked the kettle on. We tweaked and refined things a few more times, and we also added in a few new things, such as the lists. Everyone loves a list. I clicked the kettle on again. Almost a year after that initial first email I had an advanced copy of the book in my hand. Sometimes I don't stop and appreciate things that i've done, i'm so caught up with finding the next thing to work on [perhaps that's one of bad things of working for yourself.] I don't often take time to stop and enjoy the moment things are launched or released into the real world. But books are so tangible, you hold them in your hand, you flick through the pages and have a sniff of the freshly printed pages [that might be just me] that it was impossible not to get completely and utterly daft with excitement at what we had created. I bounced about the living room. I then left John at Velodrome a very very almost drunk on the moment daft voice mail. He's promised to try and play it to the world one day... That could be embarrassing.